The Right Industry + The Right Leadership = A Huge Opportunity! 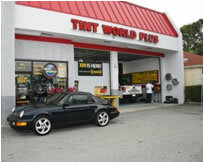 Tint World® was founded in 1982 with the opening of its first Tint World® Center in Tamarac Florida, which started a new segment to the automotive aftermarket. This new concept started out specializing in window tinting, but soon after expanded to include: auto security, car stereo & video systems, car & truck accessories and complete detailing & appearance services, thereby creating a unique "Automotive Styling Center". For over 25 years Tint World® has opened more and more centers while strategically positioning itself as the leading window tinting and automotive appearance centers by being at the forefront of the this growing market segment and having an extremely successful and vibrant history in the automotive aftermarket service industry. Today, Tint World® has grown to be the leading national franchise system of window tinting and automotive styling centers with its headquarters in Boca Raton, Florida. Tint World® Automotive Styling Centers has used its many years of experience to develop a business model that provides entrepreneurs with the same means to capture their share of the more than 38 billion dollars that are being spent annually in the growing automotive aftermarket. 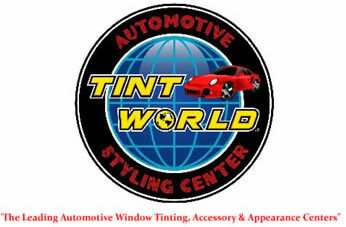 Tint World® Flat Glass Window Solutions offers and specializes in residential and commercial flat glass window tinting. Tint World® has teamed up with leading manufacturers and suppliers in the window film industry to offer high quality films to both residential and commercial customers. Our franchise owners provide free in-home design consultation and professional installation of window film from a Tint World® mobile facility. Window solar and security films are energy cost saving products and Tint World® has strategically positioned itself in the residential and commercial flat glass window film industry to provide entrepreneurs with the means to capture their share of the billions of dollars being spent annually in the home and commercial improvement industry. New advances in computer systems and digital imaging technology have created an exciting new retail and B to B market revenue opportunities. The new technologies have also significantly reduced key operating costs, which has dramatically increased profit potential. No experience or automotive background is required. Our role doesn't end when you open your doors. As a Tint World® franchise owner, you'll gain the full resources of a team committed to helping make your center a success through continued training, consulting, marketing, equipment, research and technical support. Leading Edge Technology & much more! We carefully assist you with your Tint World® site selection, analyzing factors such as traffic patterns and client potential. Only when you are comfortable with your location, lease terms and marketing area, will we move to the next phase of the process. Three-weeks of Classroom & In-Store Training in a real operating Tint World® Automotive Styling Center. Your hands-on training will teach you firsthand about how the business works. You'll watch and learn the sales process in action and interact with employees, customers and vendors to become familiar with the business inside and out. One-week of training at Your Center with one of our experienced operations advisors who will assist in your center's setup as well as the implementation of our proven marketing program. An experienced member of our Operations Team will work with you and your staff before, during, and after your center opens. 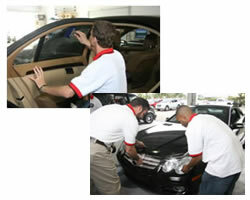 Our training programs will give you the knowledge and confidence to attack the market with all our concepts, expertise, trade secrets and work ethics that are needed to faithfully reproduce our Automotive Styling Services, in a manner that will reward you the same success in your Tint World® franchise. You will learn every phase of the business, from experienced professionals using an interactive approach at our state-of-the-art training facility. As you investigate Tint World®, we believe that you will find there is no better investment with more opportunity for less cost anywhere! Tint World® The Smart Choice! - Clearly The Right Choice! Note: Interested parties must have at least $40,000 in liquid capital. If you are inquiring about international opportunities, please be advised that Tint World® is only selling Master Licenses (no Single Units) outside of the United States. Click on Request Information button above for FREE information on how to start a Tint World franchise today! Please Note: Tint World franchises for sale, and other franchise opportunities, business opportunities, businesses and franchises for sale on this web site are not to be considered as an "offering", "franchise offering", suggestion or recommendation by GlobalBX. The franchises, businesses and business brokers seen on this web site submit their own individual content. This advertisement depends entirely on the truthfulness of the information provided by our advertisers which includes, but is not limited to, franchisers, franchises, franchise brokers, franchise consultants, business sellers and business brokers. As always, GlobalBX recommends that you consult a lawyer, financial consultant, accountant or professional advisor before buying a franchise or business opportunity or any type of business. By submitting this form and requesting more information, you have agreed to all terms and policies of GlobalBX and the business and franchise offerings listed here. Please review our Terms & Conditions for more information.